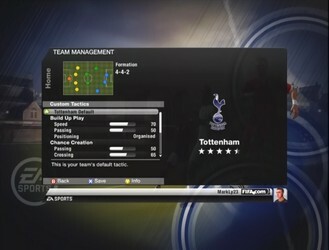 A returning feature to FIFA 10 is the choice of setting Custom Tactics. With Custom Tactics, you can make your team play exactly the way you want them to. You can expound on the strengths of a team like Barcelona with such great passing by specifying them to play with quick, short passes and increase their build up play. You could set free form positioning to take advantage of AC Milan's abundance of players who have a high positioning stat. Most importantly, you can customize your team's settings to make them play just how you want.